This Irish folk ballad is frequently voted for as the No.1 best Christmas song of all time, and reached #2 in the UK (#1 in Ireland) in 1987. It was kept off the top spot by Pet Shop Boys cover of Always On My Mind. 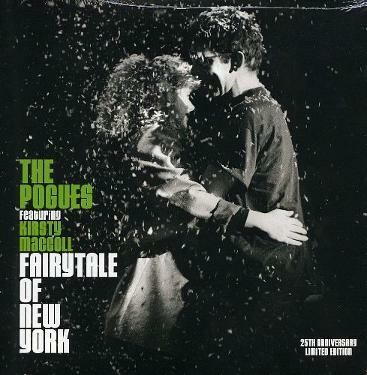 The festive tune featured on the album If I Should Fall from Grace with God, and was originally planned as a duet with the Pogues' bassist Cait O'Riordon, but he left the band in 1986 before the song was finished! Kirsty MacColl was asked to sing a guide vocal, but she was so good that she ended up singing in the final version. The Irish folk ballad was penned by Pogues band members Jeremy "Jen" Finer and Shane MacGowne and released on 23rd November 1987. The creation of the song proved to be difficult and actually started in 1985, taking two years to get to its final state, with many rewrites and re-recordings along the way. The B-side on all versions of the original single included the track "The Battle March Medley" written by Terry Woods. The 12", cassette and CD singles included a third track penned by Shane MacGowan entitled "Shanne Bradley". The video was filmed in New York during Thanksgiving week in November 1987. The close-up of hands playing the piano near the start of the video actually features the hands of pianist James Fearnley who is wearing Shane MacGowan's jewellery, ans MacGowan couldn't play the piano. As I write (22nd Dec 2018), the single has spent 93 weeks in the UK chart and is the most played Christmas song in the 21st century. The song has entered the UK Top 20 fourteen times since its release in 1987. In 2017, it reached No.7 for two weeks in December, and in 2018 reached No.10. Scroll down the page to see a Top Of The Pops performance.